It must be a true joy to be top of your division during the Age of the Big Money Fight. Now that the UFC has dispensed with the notion of deserving title challengers and matchmaking by ranking in favor of fights that satisfy an immediate and profitable craving, champions can pick their next challengers simply by deeming them worthy and creating out of thin air the proper sense of urgency and meaning, rankings and records be damned. 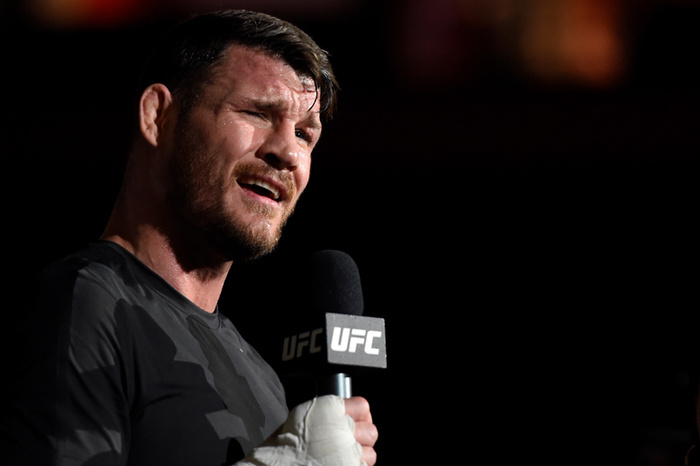 Take middleweight champion Michael Bisping, who, since winning the title back in June of last year, has defended it exactly once, and that against Dan Henderson in October, when the challenger was 46-years-old and barely hovering at the bottom of the list of top 15 ranked fighters in the division. By all sporting rights that fight never should have happened, and Bisping should have been made to fight No. 1-ranked Yoel Romero or at least No. 2 “Jacare” Souza instead. But this being the Big Money Age of MMA—the age of Conor McGregor and WME-IMG—Bisping, who knows as well as anyone in the sport how to promote a fight, was given his chance at redemption against the man who had destroyed him seven years earlier at UFC 100, regardless of that man’s age, dwindling abilities, and irrelevance to the title picture. And now he will follow up that meaningless fight with another one against former welterweight champion Georges St-Pierre, a man who hasn’t fought in three years and has never fought at middleweight—further making a mockery of the official rankings. Such is the UFC in 2017. This, after all, is the age of alternative facts, which means in MMA terms that a champion like Bisping is allowed, even encouraged, to make up his own reality—as long as that reality can be sold. No surprise then that Bisping announced on his podcast Believe You Me (and no surprise that he has his own podcast from which to make announcements) earlier this week that it should be Robert Whittaker and not Yoel Romero who gets the next chance at his crown. Robert Whittaker, who wasn’t on anyone’s title radar until he knocked out “Jacare” last Saturday at UFC on Fox 24, rather than Yoel Romero, who is an 8-0 wrecking machine in the UFC and has been waiting not at all patiently or quietly for his promised, and well-earned, title shot for well over a year. 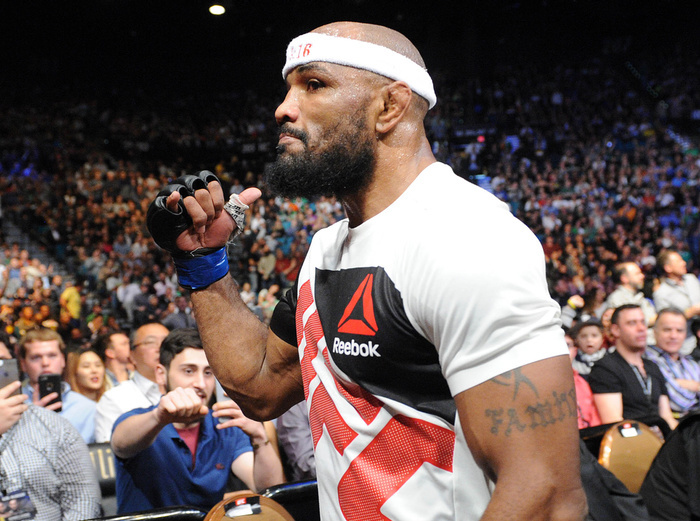 Yoel Romero, whom Bisping swore he would fight next, could be getting shoved aside yet again, only this time not to make way for a legend with whom the champion has a legendary score to settle or another legend making his long-awaited return to the Octagon, but for an up-and-comer who many casual fans had probably never heard of before Saturday. And all because Bisping seems to delight in tormenting Romero (a man he called a “dirty, lying, cheating scumbag” on the podcast) more than anything in the world, and because he’s the champion in the Big Money Era and he can. How brazen and self-aware of Michael Bisping to say such a thing: to look MMA fans straight in the eye and admit that a fighter’s ranking and record should count for less in the matchmaking process than the desires of the man holding the belt. Bisping wanted a soon-to-be-retired and unranked Henderson because he knew their history would sell tickets and he got him. Bisping wanted a rusty and undersized GSP because he knew his comeback fight would be a huge moneymaker and he got him. Michael Bisping doesn’t want Yoel Romero for any number of reasons, but perhaps primarily because he knows how much it tortures the Cuban to keep being passed over, and if modern MMA history is any indicator of future outcomes, he won’t fight him. Instead he’ll fight Robert Whittaker, not because Whittaker is the man most deserving but because the man most deserving delights Bisping more as a punching bag outside the cage than a contender inside it. How like a king. Those aren’t facts. Just a few paragraphs earlier Bisping admitted that Whittaker’s claims to be the No. 1 contender are a “maybe” at best. But Michael Bisping isn’t actually worried about facts being facts. He’s far too clever and self-aware for that. He knows something far deeper and more sinister: that facts don’t matter anymore, not in 2017, not in the UFC, not in the age of Trump and the age of Kellyanne and the Age of the Big Money Fight. And he knows that when you’re the king of such an age, facts can even be the opposite of facts and no one will care as long as they can be used to tell, and sell, the most profitable narrative possible.